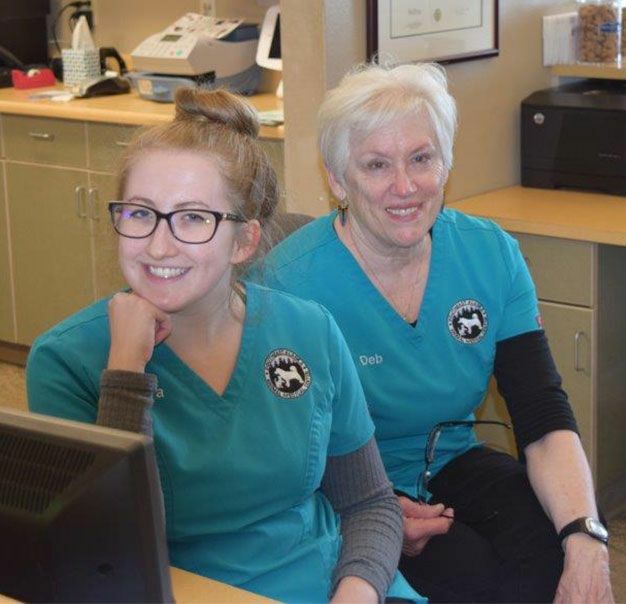 The medical reception team at Southeast Alaska Animal Medical Center strives to make your visits to our hospital the best possible. Receptionists will help you schedule appointments, answer medical questions and can even help you renew your city canine license. We will ensure that your pharmacy refills are available on the same day that they are requested. We can also prep your medical records for travel or referral within minutes of your request. When weight is a concern, come by to use our scale and a receptionist will keep up with the numbers in your chart. We strongly encourage “happy” vet visits to help your pet feel relaxed in our office. Just stop by during regular office hours for some praise and treats from our team. Robert Vogelsang, DVM and Alicia Jackson, LVT. Our support staff is a dedicated and talented team. 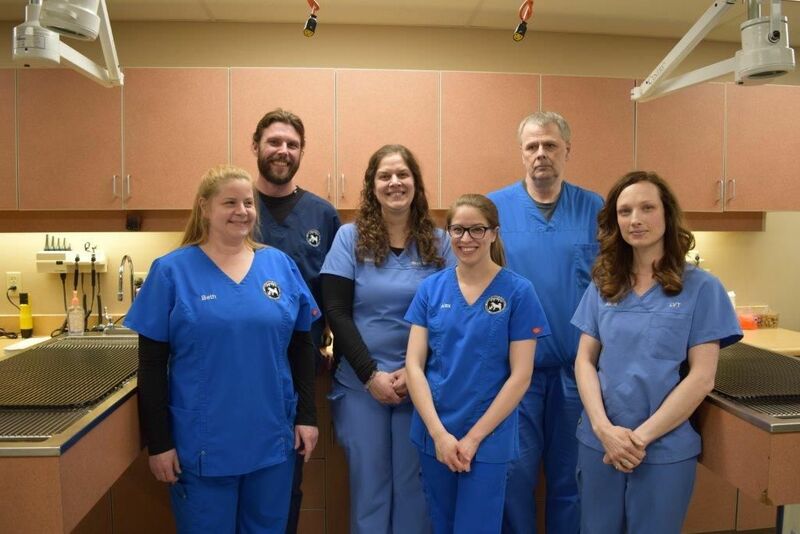 The technicians and assistants at Southeast Alaska Animal Medical Center are highly skilled. We draw blood, take dental and full body x-rays, perform lab tests, sterilize instruments and monitor anesthesia amongst other medical tasks. Always at the ready to support our veterinarians, we provide much of the hands on care your pet receives while hospitalized. For us, patient care is why we entered this field. We can also provide services like nail trims, nutritional counseling, whelping support and fluid therapy. 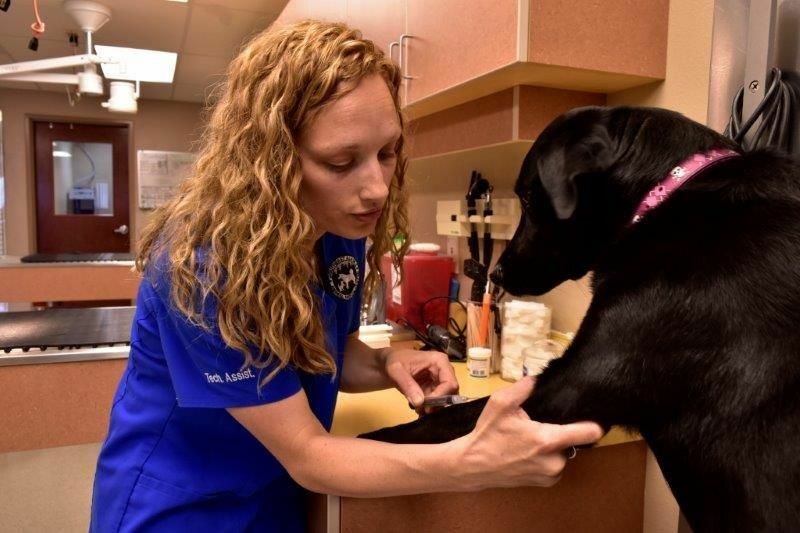 Licensed Veterinary Technician, Alicia Jackson, draws blood on labrador mix, Gracie. 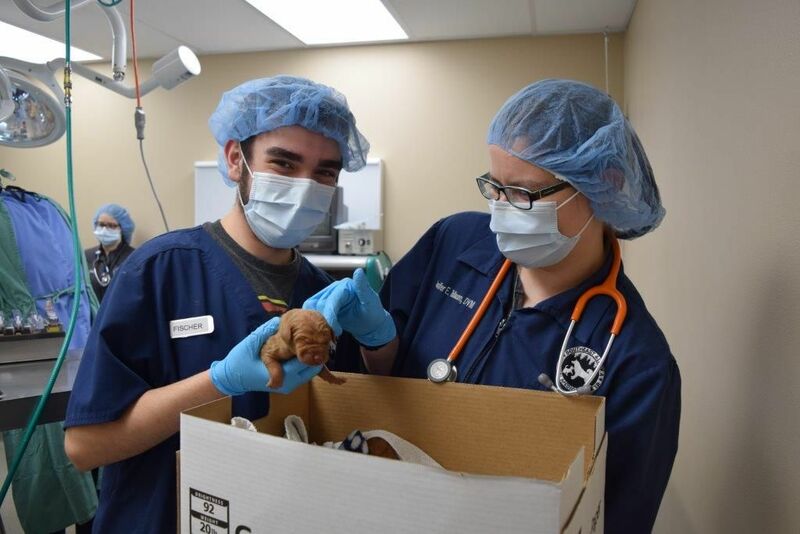 Fischer Rago assists Dr. Jennifer Tobiason with a litter of puppies delivered via Caesarean Section. Top, L-R: Jordan Bales, Jill Bailey, Rose Hubbs, Annnissa Coleman, Kearsti Backhaus and Supervisor, Mike Larue. 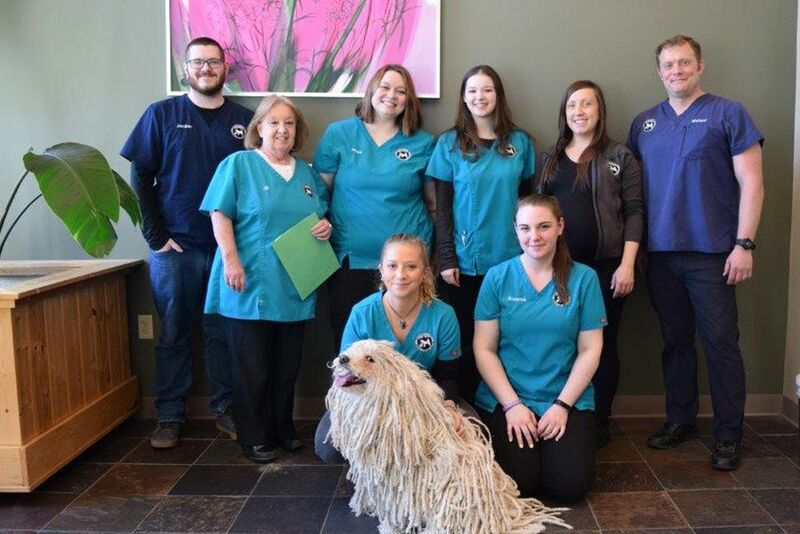 Second Row, L-R Lasacha Everson Friedrichs, Shawna Hammonds and special guest Hold 'Em, a Puli owned by Ian Smith. Medical Receptionist, Annissa Coleman cheerfully awaits the next patient. Sierra Larson and Deborah Craig agree that working with so many animals is the best part of their job.